Our last remix competition with Kmag in 2012 went so well we’ve teamed up with them again for another one. Download the parts and rework Blu Mar Ten & Seba’s ‘Hunter’ to be in with a chance of seeing your remix released alongside other interpretations of our Famous Lost Words album by Ulterior Motive, Break, Frederic Robinson, Kid Drama, Anile, Nuage and Kimyan Law. The winning remix will be professionally mastered at Finyl Tweek and released as a digital exclusive as part of the Famous Lost Words remix project. The winning remixer will also receive a full set of much sought-after Blu Mar Ten Music vinyl releases plus a SoundCloud Pro Unlimited account. One runner-up will win a full set of Blu Mar Ten Music vinyl releases and a SoundCloud Pro account. All the parts to the track are available to download here. 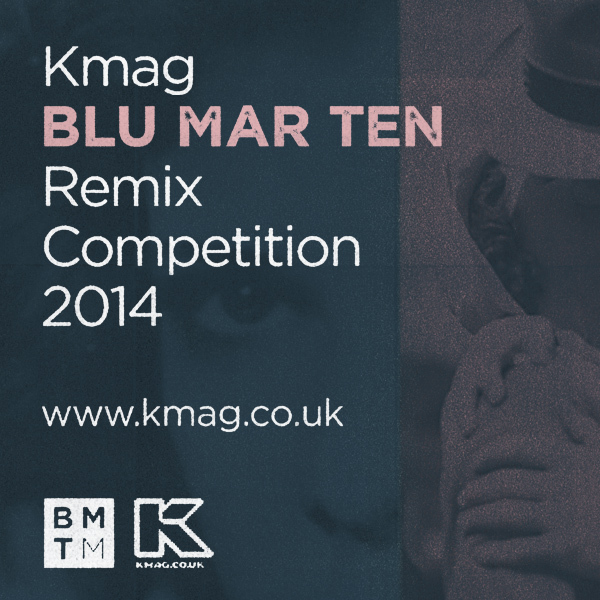 Create your remix then submit your entry to the Kmag Blu Mar Ten Remix Competition Group by 20 April 2014 at 23:59 GMT. Please note that your submission MUST have downloading disabled. For full terms & conditions go to the bottom of this page. Please read the terms carefully before asking questions about the competition. Kmag: This is your second remix comp with us, what do you remember about the first? Yeah, the last time around was really enjoyable, especially when you come across those remixes that stretch the interpretation as much as possible. The most difficult thing was picking a winner. Once you narrow it down to about ten tracks it’s almost impossible to pick a favourite. Kmag: Tell us more about the remix competition track… what did you have in mind when you made it? ‘Hunter’ is a collaboration between us & Seba. We started it back in 2011 then forgot all about it until my girlfriend found it and forced us to finish it. We really went for that wide-screen Vangelis soundtrack feel with the synths and liberally laced it with organic sounds like pianos, bells and hissy white noise to offset the cleanliness. Kmag: What are you looking for in entries to the competition? Exactly the same approach as the 2012 competition. We want people to take the idea and make it their own… really stretch the track and do something different to it. We want to hear some character and invention, not just a version of the track that sounds kind of similar but not quite as good. Don’t get moody if we pick a winner that’s not d&b. The winner of the 2010 remix comp was an acoustic piano piece and the winner of the 2013 comp was a bubbling house/breaks hybrid. We’ll pick whatever we think is best, regardless of genre. Kmag: What advice do you have for anyone entering the competition regarding the direction they should go? As above, be inventive with it. The worst ones are where someone’s just taken the parts and strung them out in a slightly different order. Don’t do that! We don’t care what genre it is, just make it good and make everyone sit up and pay attention. The winning remix will appear alongside some of the best producers around right now so take the time to make it as good as you possibly can. Don’t rush it! 2. All entries must be received by midnight on the stipulated closing date. Those not received by the deadline will be invalid to enter. 3. All entries must be submitted via the Kmag SoundCloud Remix Group Dropbox. Entries submitted via other means will not be accepted. No responsibility can be accepted by any party for entries not received due to technical or other delivery difficulties. 4. The winner will be selected after the closing date at the discretion of Blu Mar Ten, whose decision is final. The winner will be notified within seven days. 5. Winner will be the remix submitted from all relevant entrants as the one most liked by Blu Mar Ten. 6. ‘Winning’ means that your remix will be featured as a digital release along with remixes from other artists of Famous Lost Words tracks with full credit to you. It also means that you will receive the prizes offered by our participating partners. Winning the competition does not entail any form of financial reward for entrants. 7. If you enable downloads of your remix or distribute it in any way prior to the close of the competition you will automatically be disqualified from winning. If the winning remix is found to be distributed prior to release Blu Mar Ten reserves the right to disqualify the winner and choose an alternative. 8. Your remix can be any style of music you choose and can be as similar or different to the original as you wish. 9. You may use as many or as few of the samples as you see fit and you may add as much of your own content as you wish. 10. Unfortunately we are not able to enter into ‘feedback’ conversations about entries, please use the SoundCloud group discussion page to solicit feedback from fellow group members. 11. Please do not submit unfinished tracks or ‘works in progress’. These will be automatically disqualified. 12. You may enter more than one remix but you are only allowed to submit each remix to the group once, so make sure your entry is the final version when you submit it. Resubmissions will be automatically disqualified. 14. The winning remix will be professionally mastered at Finyl Tweek. 15. All parts made available to download, and all parts downloaded remain the property of Blu Mar Ten. All remixes completed, whether submitted in this competition or not, remain the property of Blu Mar Ten. No exploitation, or distribution of remixes shall be permitted without the sole written consent of Blu Mar Ten. 16. No purchase necessary and no proof of purchase required. 17. Blu Mar Ten’s decision is final and no correspondence will be entered into. There is no cash alternative and the prizes are non-transferable. 18. Blu Mar Ten & Kmag reserve the right to verify the eligibility of applications. 19. The winner’s name may be published on kmag.co.uk, blumarten.com and Blu Mar Ten & partner’s social networks after the closing date of the competition. Blu Mar Ten and participating partners reserve the right to contact the winner for permission to involve them in any post competition publicity and the winner agrees to such activities and shall make themselves reasonably available for such purposes. 20. Your entry must not infringe on the rights of any third party, including, but not limited to copyrights, trademarks, or rights of privacy or publicity, or other intellectual property rights. By entering this competition you indemnify Blu Mar Ten & Kmag against any such infringements. 22. Prize is subject to final selection. In the event of unforeseen circumstances, Blu Mar Ten & participating partners retain the right to offer alternative prizes. 23. Entering the remix competition implies full acceptance of these terms and conditions, which are legally binding. Blu Mar Ten & Kmag reserve the right to disqualify any entrant if we have reasonable grounds to believe the entrant has breached any of these terms and conditions. 24. The competition and the terms and conditions of this agreement will be governed by the law of England & Wales.